Christopher Latham Sholes, the man generally regarded as the 'inventor' of the typewriter, did not retire from the typewriter invention business after his first machine had created a market for itself. He went on to develop a visible writer, with excellent adjustment. The machine, the Sholes Visible, appeared in 1901, a quarter of a century after the Sholes and Glidden and 11 years after C.L. Sholes' death. What was unique about the Sholes design was that the type bars were sticking forward at an angle from the front of the machine, in two rows, with a narrow channel between them. On typing, the selected typebar would move sideways to the center of the channel, and then forward to strike the paper. The stiff bars, and the slots in the front of the body of the machine, helped keep the type rigid and well aligned. In total three different versions of the Sholes Visible are said to have been produced. The model presented here is the third in the series, that has a regular carriage return lever. The earlier model had a pinch-lever for spacing. The first model (apparently the one built by the Sholes company) had no cover over the typebars on the front of the machine. 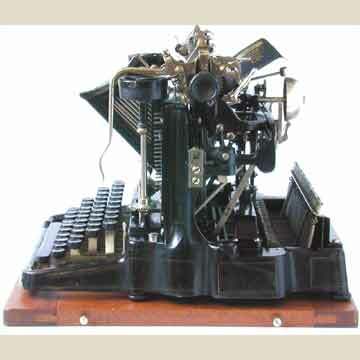 Youâ€™ll find more about this machine in the book TYPEWRITER, page 166.